6.) Hurrah for the Forth of July! We also received a PDF copy of the accompanying lapbook. 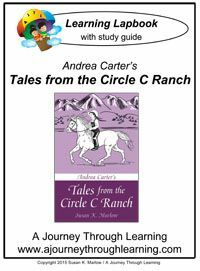 The "Andrea Carter's Tales from the Circle C Ranch Learning Lapbook" can be purchased separately, and is a great addition to the book! 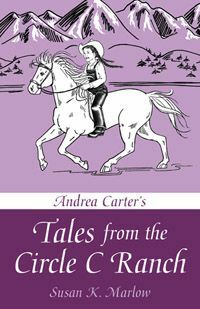 As I mentioned above, I had not experienced any of the books based on Andi and the Circle C Ranch until this review, so I was not really sure what to expect. I received the book, and had intended to read it as a bedtime story to my son-one short story each night. These stories are so engaging, and so entertaining, that we couldn't stop with just one. Susan K. Marlow's writing draws you into the story, and helps you to develop a true connection to the characters in such a way that you don't want to stop reading. These short stories are written in a way that is more like some one is sitting around telling of a specific incident that happened to them. One of my most favorite things growing up, and one of my most cherished memories, was sitting around at night listening to my dad and his brothers tell stories of them growing up, and even after they had grown up. For example, my two uncles shared a house together for a while and one of them just HAD to have a goat to tie outside to help maintain the property (rural farm land.) They had fixed themselves a really nice Thanksgiving dinner, and after they had eaten some one left for a bit and the other decided to take a nap. Something happened, and that goat got loose, got into the house, and ate all of their Thanksgiving dinner! This book, and the way it is written reminds me so much of those stories, and brings back such fond memories of my dad and his brothers, that it's impossible for me to not love it. We have not put together the lapbook yet. I wanted to do an initial reading first, then discuss the main point of each story in more detail while working on the lapbook. For example, with the first story we have been talking about social rules for the way people dress. So we have finished that aspect of the lapbook and discussed how little boys and girls were often dressed the same due to costs and ease of toilet training. Then we jumped a bit to "Snake's Alive," and now we're on "Aunt Rebecca and The Hat" since I've been doing a lot of photography work, this is the topic of the day. We've really gotten into the "History of Photography" thanks to this, so I expect we will be spending a great deal more time exploring the history of photography, and looking at old photos. The lapbook is a fun, hands on way, to bring this book to life and delve deeper into the study of history from the time period of the 1800s, and more. For example, in the section that covers "Aunt Rebecca and the Hat" your student will be asked such things as "What two Greek words make up Photography." Or "Why did a photographer cover himself and his camera with a black cloth?" Critical thinking questions like that can be used to bring a new level of learning to an already great book. Overall, Susan K. Marlow does a fantastic job of writing a companion book that can really stand on its own, and is a fun way of learning about American History during the 1800s. We did not feel lost or confused at all. I was concerned that we would feel like something was missing due to the fact we've not read any of the others, but that wasn't the case at all. This book is a great example of how reader feedback and questions can influence an author, since this book is an answer to numerous reader questions and comments. We have thoroughly enjoyed this book and highly recommend it if you have not read any of the Circle C Adventures books! This would be a great way to test the waters! And if you have, this is a great way to revisit old friends! This was such a delightful read (your review, of course). I was drawn in to your stories about your childhood and your dad and wow . . . how close it was to my made-up scenarios. thanks for sharing your heart. It brought a smile to my face! Thank you! The feeling I got while reading that first story....I just can't even explain it. The similarity between the character of her dad and my own dad is just amazing. That's the only way I can describe it. I can remember my dad dressing me in my brother's old hand me downs to go work in the barn, then tossing me up on the horse to go mend fences, or in the truck to pick up things we needed. Thank you, again!